Not sure what a Carpe Diem event is? Read all about it here. Today we bring you the highlights of our March 2018 Carpe Diem event. We put together an amazing cast of gastronomy celebrities including Michelin triple-star chef Jacques Pourcel, Meilleur Ouvrier de France Frédéric Jaunault, and our very own La Maison Hubert herbalist Anaïs Kerhoas. 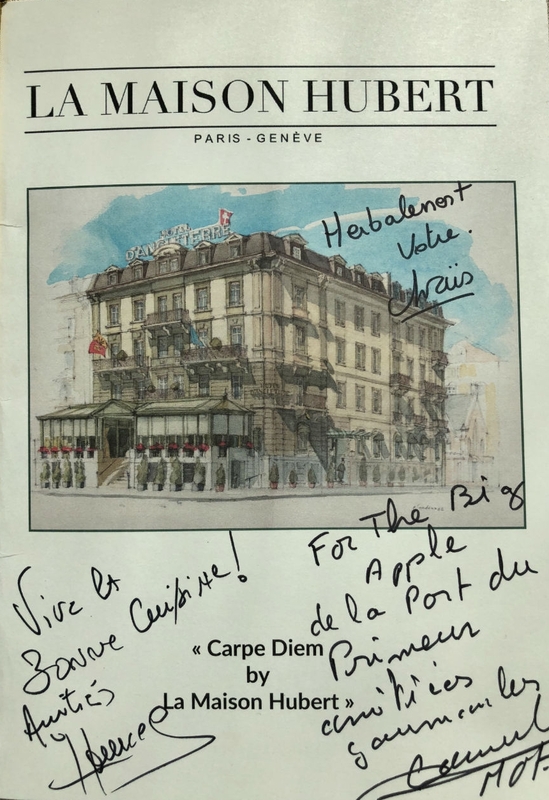 Then we brought them over to world-famous Hotel d'Angleterre in Geneva, Switzerland to meet with and serve our guests over three days of culinary bliss! Everyone tasted the chefs' exclusive creations of course. But more importantly, each guest personally met with each artist one after the other as they came over to serve and talk about the dishes they created specifically for this event. The Carpe Diem event is not just about delicious food. It's about meeting and interacting with exceptional human beings. Beautiful Lake Geneva was the backdrop for each of these six amazing events (three days of lunch and dinners). And clearly, the Swiss weather gods smiled on us that week as the chefs and artisans signed menus for any guest who requested it. For a little behind-the-scenes action, check out this video of La Maison Hubert herbalist Anaïs Kerhoas presenting and explaining her new La Belle des Bois herbal mix tea she designed exclusively for us (and presented to all our guests during the event). This and another "surprise" custom-designed La Maison Hubert creation of hers will soon be available on our online boutique. Get notified as soon as these unique products become available by registering here. So when is the next Carpe Diem event? Excellent question! It's on October 6th, but for all the details, you'll need to watch or attend the Q&A luncheon we are organizing for the big announcement September 10th. Also make sure to sign-up for our "Insider" newsletter and keep checking for our latest news on our reservation center.